Watch this exclusive Mr. Media interview with Conan writer Rob Kutner, who talks about the new futuristical musical 2776, and two live musical performances by Joel Levinson and Stephen Levinson by clicking on the video player above! 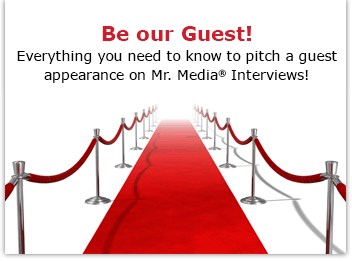 Mr. Media is recorded live before a studio audience of people who are willing to laugh at anything for a good cause … in the NEW new media capital of the world… St. Petersburg, Florida! America is a thousand years old and an evil alien, played by Martha Plimpton, threatens to destroy the country, unless the President – Will Forte – and his Secret Service agent – Aubrey Plaza – can deter her. Oh, and 2776 is a musical that plays out over 28 songs and a series of music videos. Sort of like the Bicentennial Broadway musical “1776,” but in an earthy, street language and rap style that the Founding Fathers couldn’t begin to decipher. Created by The Levinson Brothers, Joel and Stephen, with Rob Kutner, this craziness about the year 2776 features performances by more than 80 singers, comedians and actors, including Patton Oswalt, Ellie Kemper, Aimee Mann, Paul F. Thompkins, Triumph the Insult Comic Dog and many more. It comes on a CD being sold to benefit OneKid OneWorld, a foundation for education in impoverished communities throughout Kenya and El Salvador that gives children from primary through secondary school the opportunity for a better and brighter future. Joining me to explain all of this is Rob Kutner, long-time comedy writer for Conan O’Brien on both his TBS show, “Conan,” and “The Tonight Show with Conan O’Brien” before that. Kutner has also been a staff writer for “The Dennis Miller Show” and “The Daily Show with Jon Stewart.” This is his third Mr. Media appearance. Rob Kutner, staff writer for ‘Conan,’ is a co-creator of the year 2776 musical.